The Baltic island of Rügen had been part of Swedish Pomerania from 1648 to 1815, at which point it passed to Prussia. With its striking white chalk cliffs, Rügen was – and still is – a popular North German tourist destination. Caspar David Friedrich's portrayal of a seemingly idyllic afternoon of seaside sightseeing is one of the least melancholy works ever painted by this quintessentially Romantic artist. Not surprisingly, it was executed during a brief period of hope – both in Friedrich’s personal life and in the political life of the German nation. In the summer of 1818, Friedrich was on his honeymoon: the woman in the eye-catching red dress is almost certainly his bride, Caroline. Friedrich himself is the figure in the middle. He has cast off his hat and walking stick, and has gotten down on the ground, presumably to peer over the edge of the cliff. 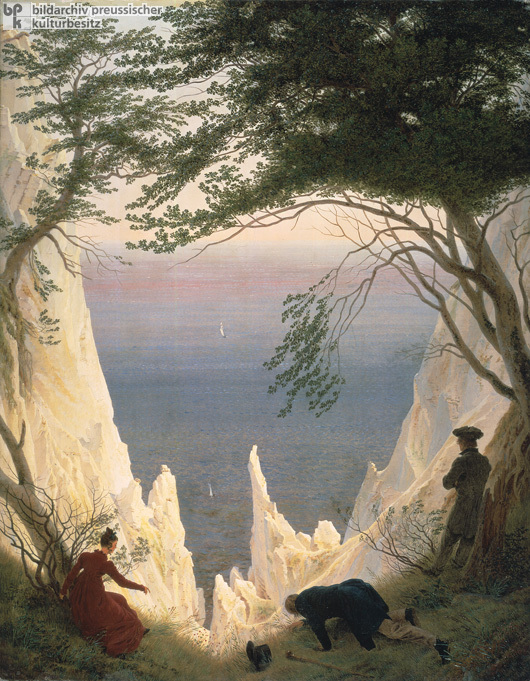 Whereas Caroline represents Friedrich’s personal life, the figure on the right speaks to the larger political context. Dressed in the old German [altdeutsch] costume of the student fraternities that formed in the wake of the Congress of Vienna on the model of anti-Napoleonic freedom corps, this figure represents the liberal nationalists who, at the time, were still basking in Frederick William III"s promise of constitutional and democratic reforms. Metternich's Carlsbad Decrees, which would outlaw both the costume and the fraternities, and censor everything they stood for, were still a year away.